War can change a person. It's proven fact. What you see and do on the battlefield can have a serious affect on the mind. Post-war PTSD and racial treatment are key players in Kristiana Rae Colon's Vietnam era psychological drama but i cd only whisper. Equipped with brazen movement pieces, exposition-filled monologues, and a series of intense sense, but i cd only whisper is heavy with a clunky script that gains steam a little too late. 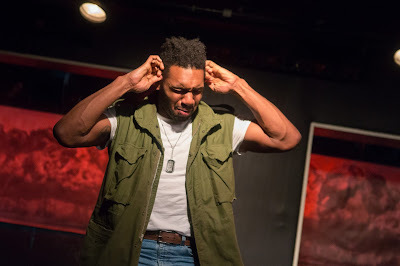 Colon's play literally gets inside the brain of Beau Willie Brown as he struggles with life following a stint in Vietnam. With theatricality taking shape, but i cd only whisper explores modern themes through a period lens proving time has come but change has not. With a strong thesis within, but i cd only whisper tries to do a little too much. The script jerks the audience around stylistically, gaining intrigue and momentum only at the big climax. Structurally, Colon vastly spreads out her story, offering many pieces of the puzzle over the ninety minute drama. There is often a lot of character and story information to take in at once, and unless you are fully engulfed with the action occurring right in front if your face, it may be hard to engage. And this is due entirely to David Monteagudo's staging in the basement black box of The Flea. Attempting to use every nook and cranny of the unique space, there is a natural disconnect built in. This is one instance where space is a hindrance. but i cd only whisper relies on intimacy. With monologues and duets between subject and shrink being the prime use of storytelling, the stray scenes Colon adds happen to be the most interesting. Especially the scene between Crystal, Genevieve, and Marvin. It proves that the confessions may not be serving the play best and desire scenes to receive intel. With the text having its own series of woes, but i cd only whisper happens to be exquisitely performed. As the central character, Toussaint Jeanlouis is absorbing, easily drawing from an array of sensations. Jeanlouis taps into the inner demons of Beau Willie Brown to offer a brilliantly rich performance. Being the one asking all the questions can lead to a drab performance but Brandon Rubin brought great depth to Drummond. Rubin went beyond our way into the story, giving his characters varied layers of buoyancy and skepticism. Crystal Arnette had a fire in her eyes as Genevieve. Her character’s persona was large but her grandeur controlled the room. While it may simply be due to the fact that I served as the seat where he was directed to converse, when Akeem Baisden Folkes spoke, you listened to every single word. His words dripped with fervor. Colon’s script jerks around stylistically and director David Monteagudo didn’t quite rein it in together. Like the play itself, Monteagudo’s vision was clunky. With heavy material all around, there was natural tension that filled the room. But what Monteagudo did well was find a way for the audience to get inside Beau Willie Brown’s brain. The piercing ring from sound designer D.R. Baker was exactly the sound necessary to evoke the sensation Beau was feeling. The Vietnam vibes pervades the production, especially through Ari Fulton’s costumes. The pieces Fulton chose to dress her company were iconic to the decade. From the high-waisted jeans on Crystal to the hair and blouse on Genevieve to the camo color scheme on Beau, Fulton captured the times. Though the play lives in a specific period, Kristiana Rae Colon’s story still rings true. Her thesis within but i cd only whisper is bold but the execution of the script and production was not.